Card printing plays an important role in your business. You want a card printer that can print virtually any type of card with blazing speed, while minimizing the impact on your operational efficiency and workforce productivity � a card printer that�s flexible, secure, easy to set up, easy to use and easy to manage. You can have it all with the ZC350. You get comprehensive card printing options. Print single-sided cards in color or black and white, with specialty ribbons that offer special effects that will impress card recipients and make your cards hard to counterfeit. For example, add color-shifting graphics with a new pearlescent ribbon. Use 3D effects to make logos and text stand out with a new metallic ribbon. Add a watermark for simple elegance or additional counterfeit protection. Or add a highly durable protective layer to create cards that can last for years. Comprehensive encoding options allow you to easily create cards for any type of transaction � contact, contactless or magnetic stripe. And with fast printing, workers spend less time printing and more time on more crucial tasks � and customers spend less time waiting for cards to print. You get elegant engineering for game changing simplicity. The ZC350 is plug and play, right out of the box � no configuration needed. The ingenious card feeder self-adjusts to card thickness. The new driver offers a graphical user interface that brings a new level of simplicity to managing the printing process and the look and feel of your printed cards. There is only one way the ribbon can be inserted into the printer for fool-proof ribbon changes � and with smart chips in the ribbons, you�re sure to always change ribbons before they are spent, avoiding needless printer downtime. Need to manually insert a card? The light pipe takes away any confusion, guiding users on where and how to insert the card. And with support for many diverse languages, the ZC350 is ready for deployment in any part of the world. The ground-breaking �fits everywhere� design is right at home anywhere in your business � from offices and back rooms to customer-facing areas. The slimmest profile and lowest clearance requirements allow the ZC350 to fit practically anywhere, providing the greatest deployment flexibility � it easily fits under a shelf and in other space constrained areas where other printers just can�t fit. Security features enable no-risk card printing in public-facing spaces, from a printer cover lock that prevents the theft of card stock and printed cards, government grade encryption to protect the most sensitive data and printer-to-host authentication to prevent unauthorized applications or mobile devices from printing cards. And with Link-OS for Card inside, Zebra�s powerful printer operating system, you also get Print DNA, a family of printer software applications that puts the ZC350 in a class of its own by making it easier that ever to integrate card printing into your apps, design cards and support your ZC350 card printers. 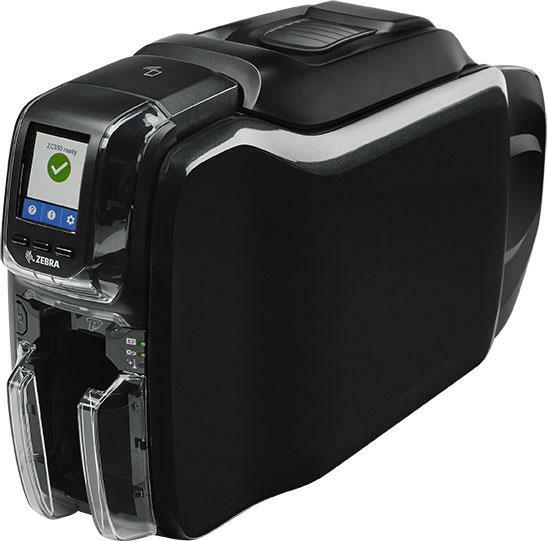 The ZC350 Series � the card printer that delivers it all. Printing throughput (cards per hour) based on batch printing with USB connectivity. Times may vary depending on the computer configuration. genuine ribbons. Ribbons are included in a simple-to-load cartridge. Ribbon availability may vary by region. NOTE: For optimum print quality and printer performance, use of Genuine Zebra supplies is recommended. Please see www.zebra.com for an up-to-date listing of supported systems. Included with the printer, this simple-to-learn and feature-rich card design software that makes it easy to design loyalty cards, gift cards, ID cards and more. With a single tap, you can use Android-based mobile devices to access how-to and troubleshooting information to help keep printers up, running and available. About Print DNA. Print DNA propels your Zebra Link-OS for Card printers into a class of their own, providing Zebra-only software tools that make life easier for everyone who touches your printers, from printing to printer management and application development. Features are subject to availability. Specifications are subject to change without notice. The Zebra ZC350 Single Sided ID Card Printer features a 2-year warranty on printer and printhead, plus 1 year printer loaner coverage.